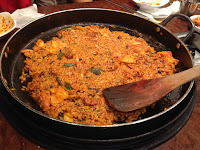 Now that I’ve gotten past all the cultural things, I can talk more about specific Korean dishes! I’m going to miss Korean food a lot. 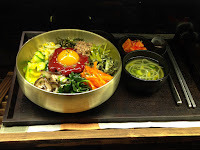 -Bibimbap (비빔밥), one of the most well-known Korean dishes, is popular among many foreigners, especially those seeking some vegetables in their food. 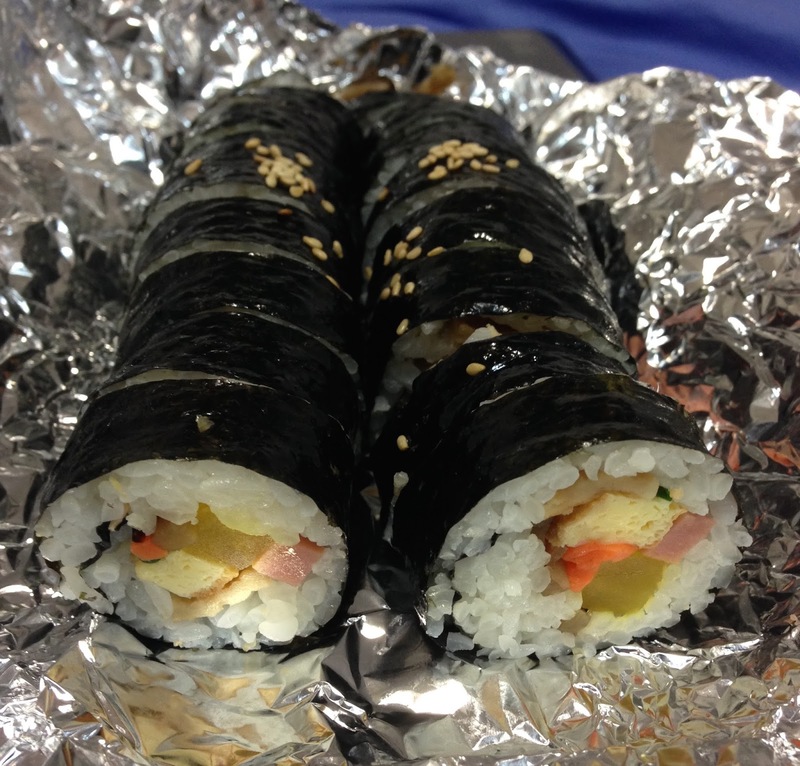 It’s kind of like a meal version of a kimbap. 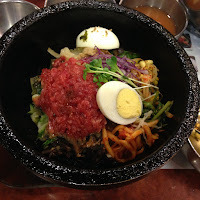 The basic kind has rice, a fried egg, a mixture of stringy vegetables, and gochujang, a spicy red pepper paste sauce used in lots of Korean food. I grew to like this sauce so much that I actually bought my own and started putting it in my own cooking for extra flavor and a little kick. 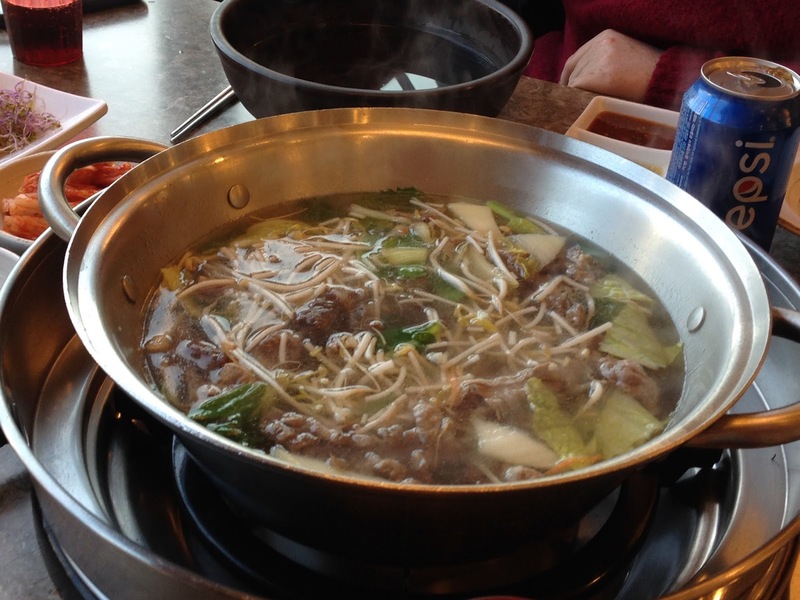 In nicer restaurants, you can get bibimbap with raw beef that actually cooks on the surface of the sizzling hot pot. If you treasure your fingers, touching the bowl directly is not advised. 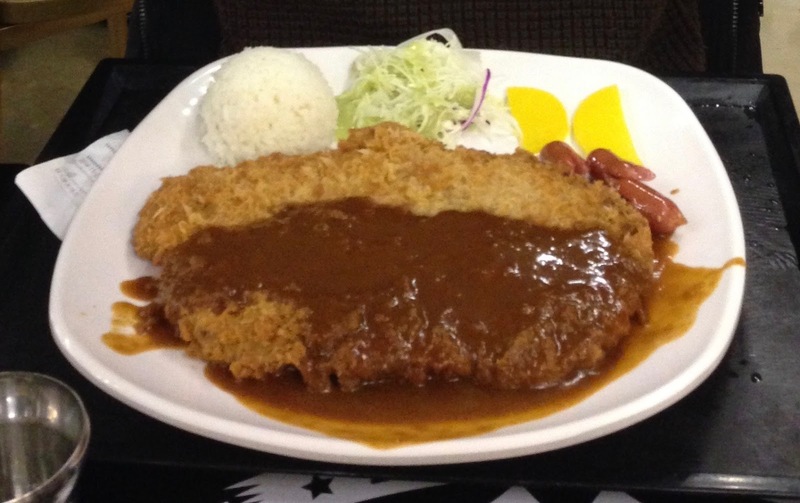 -Donkasuh (돈가스), which actually originated in Japan, is a giant fried and breaded pork cutlet with a sweet “cur-ray” sauce. It’s very cheap and can be found almost everywhere. 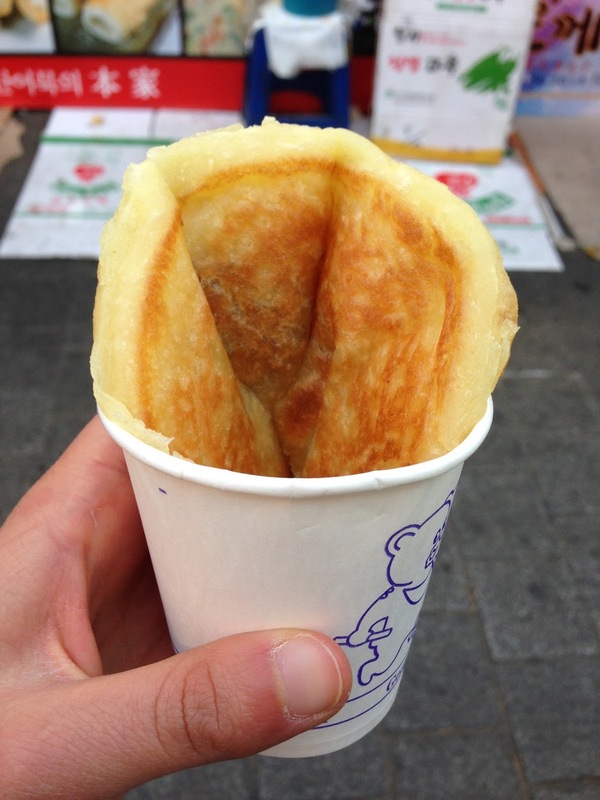 You can even get a version of it that’s just fried cheese. -Jjim-dak (찜닭), which means “steamed chicken,” is a flavorful, soupy, and spicy glass noodle dish with steamed potatoes, carrots, onions, and chunks of chicken. 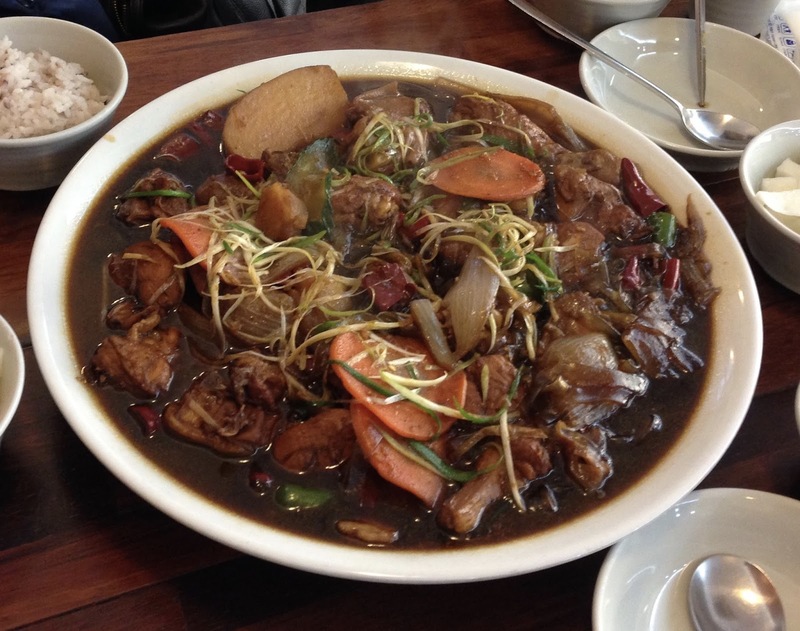 It comes in a giant plate that you share with others, and very often, despite the presence of noodles, it’s still eaten with a small bowl of rice on the side. Sadly I’m not yet skilled enough with chopsticks to gracefully remove the bones from slippery, sauce-covered pieces of meat. 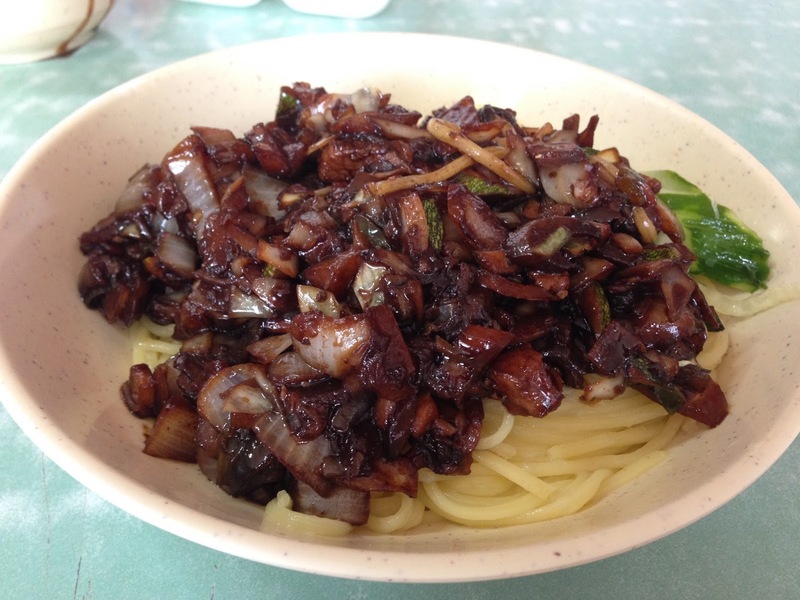 -Jajangmyeon (자장면), or black bean noodles, originated in China but are a popular dish in Korea. Supposedly it’s a tradition that people who are single on Valentine’s Day come together to eat jajangmyeon in sad solidarity. -Pajeon (파전) is kind of like a non-dessert pancake eaten with a very strong, salty dip. 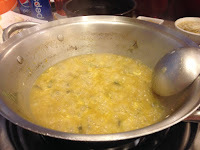 It can be made with green onions alone or also with seafood. I can’t say I’m a big fan of the chunks of squid, though. -Kimchi chigae (김치 찌개) is a hot-pot soup made of kimchi, noodles, and pork that comes out of the kitchen literally still boiling. It’s spicy, full of flavor, and served with rice. Of course. -Toppokki (떡볶이) and rappokki (라볶이) are my guilty pleasures. 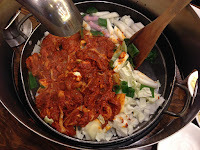 Toppokki, sold by both street vendors and small kimbap restaurants, is made of soft, cylindrical rice cakes swimming in gochujang sauce. It’s nothing but spicy, carby goodness. But even better, though I feel like I’m killing my insides every time I eat it, is rappokki: the usual toppokki rice cakes and sauce plus fish cakes, a full serving of ramen, and maybe a boiled egg on top. It is to die for. -Dakgalbi (닭갈비) is a delicious combination of chicken, cabbage, potatoes, rice cakes, cheese (optional but always recommended), red sauce, and, if you’re still hungry at the end, rice. It’s slightly spicy and absolutely delicious. 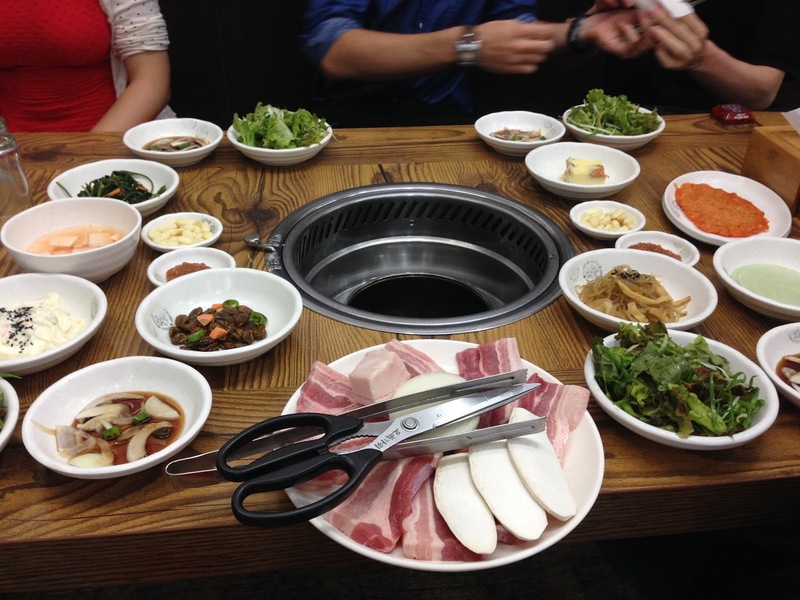 The waiter starts by putting a big pan of the stuff on the stove in the middle of the table. (He also puts a tall metal ring around it so no one gets splashed; some restaurants even supply aprons.) As it heats up and starts sizzling, the waiter periodically comes by and stirs it temptingly in front of you. After a few minutes he adds the cheese, and a few minutes later it’s ready to eat. When the food starts to dwindle, you have the choice to add rice to the pan. The waiter mixes the rice with the rest of the sauce and food and the eating continues. -Shabu shabu (샤브 샤브) is truly wonderful. It’s the longest meal I’ve had—2 to 3 hours from start to finish, if you like your company—and is definitely not a good option for a rushed lunch hour. It’s such a long process that I’ve even divided it up into five steps. 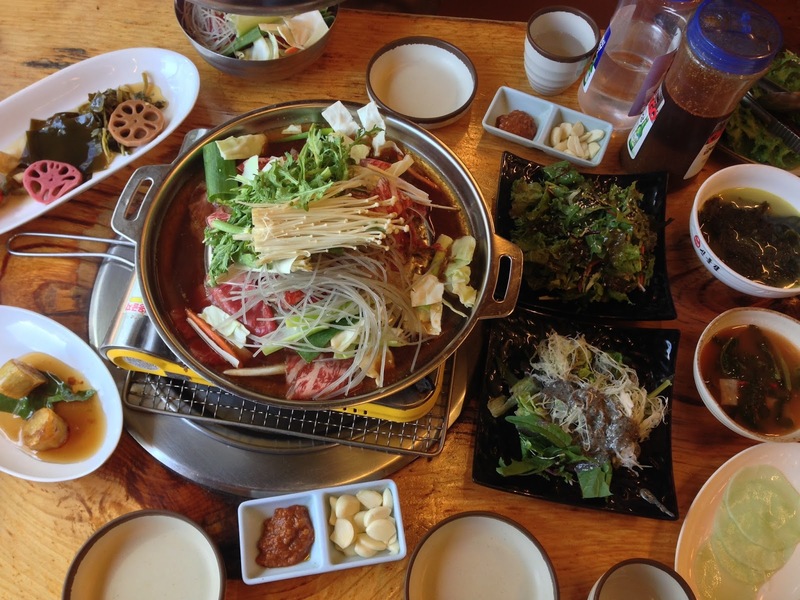 1) Let’s begin with the elaborate layout of the shabu shabu meal. Each person gets a bowl, a plate, and three dipping sauces. The shredded veggies and thin rolls of raw beef are for sharing. 2) First you add some meat, leaves, and sprouts to the pot of boiling water in the middle of the table and wait patiently while they cook in front of you. Once they’re done, you add some of the soup to your own little bowl. 3) Then you pick up one of these seemingly inedible plastic-looking things (left) and dip it in a bowl of hot water. It turns out that thing is actually the wrap for your little hand-made spring roll. I’ve learned since that these are common in Vietnam. You put it on your plate and quickly add some cooked meat, shredded veggies, and sauce. If you wait too long, the wrap will get too sticky. Roll it up and start eating. 4) Once you’ve finally run out of wraps, then it’s time for…noodles! A waitress comes and adds a bowl of white noodles into the main pot. You wait a bit for them to cook, and then dive in. 5) BUT WAIT! You’re still not done! After you finish all the noodles, the waitress comes back to your table and dumps in a small bowl of rice. Because no Korean meal, no matter how large, is complete without rice. She stirs it around in the remaining liquid until it becomes a sort of porridge. You wait for the mixture to cool down, dig in, and then finally, the marathon of deliciousness is over. 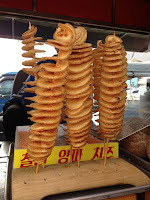 -The strangest food I’ve eaten in Korea is hands down beondegi (번데기), or silkworm larvae. 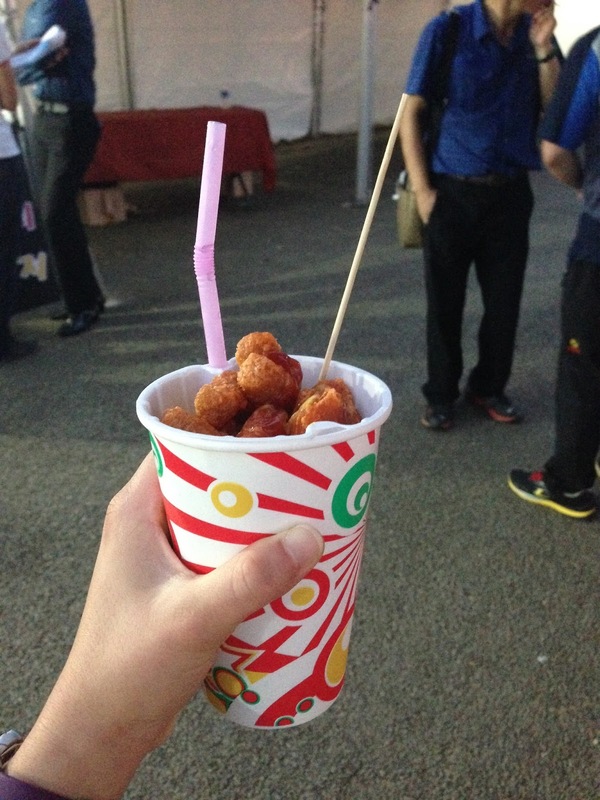 They’re a popular street food with a very distinctive smell and a very unappealing look. They’re essentially little slimy brown pre-bugs that taste like dirt. I’ve found that most people either love them or hate them. 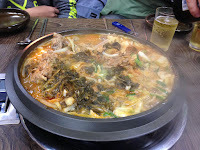 My non-Korean coworkers insisted I try one as an “initiation” for my first dinner out, and I gave them another chance a few months later, but they were gross both times. -Next is jellyfish salad. I’ve only ever had it at one restaurant, but it’s strangely yummy. Its texture is exactly what you might expect from a jellyfish: kind of like a long, thin gummy worm. There are also stuffed pig intestines, but I was never brave enough to try those. 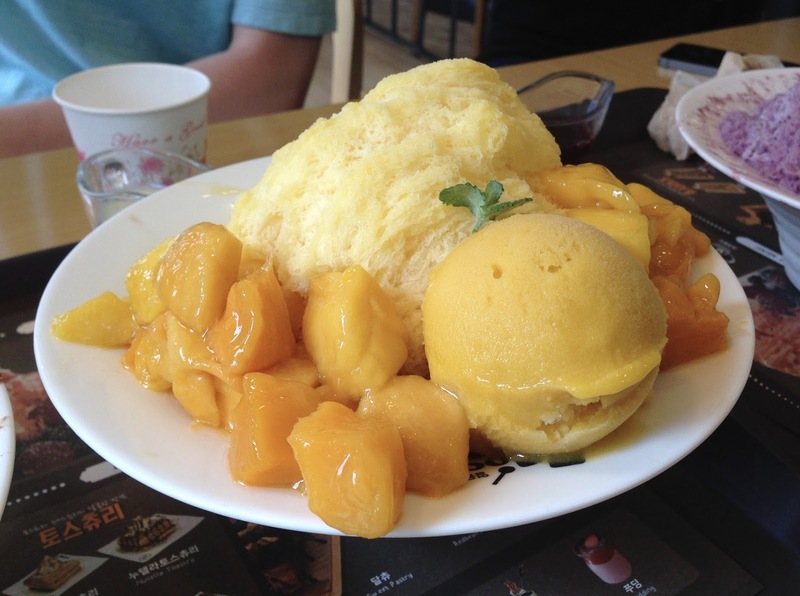 -Korean convenience stores are known for having great, cheap ice cream. And trust me, I’m all for ice cream. 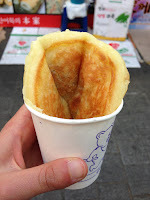 But many Korean street vendors make eating ice cream a potentially awkward experience with their very phallic, J-shaped ice cream cones. The cone itself is porous and a bit dry, but the ice cream itself isn’t bad. Just maybe don’t post a picture of yourself eating one of these cones online. 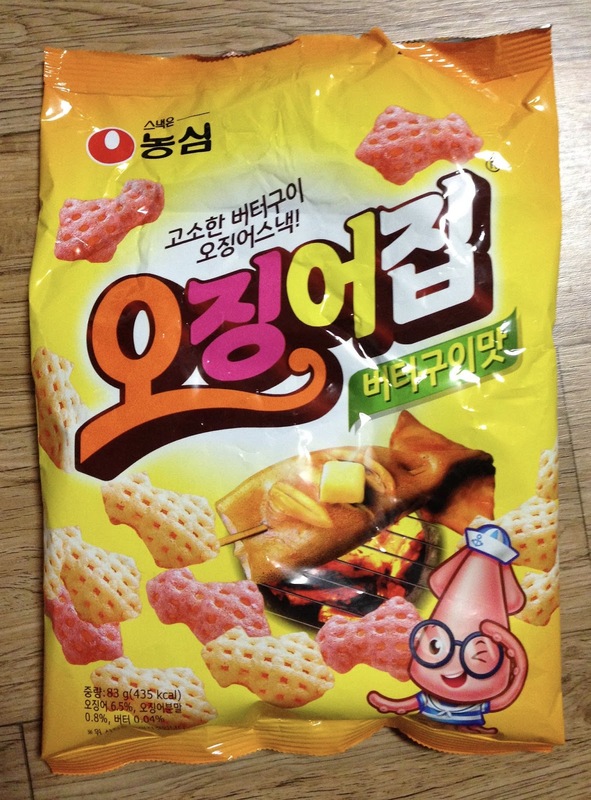 -Finally, my favorite strange food: squid chips! It sounds nasty, I know, but there is only a slightly fishy flavor to them. 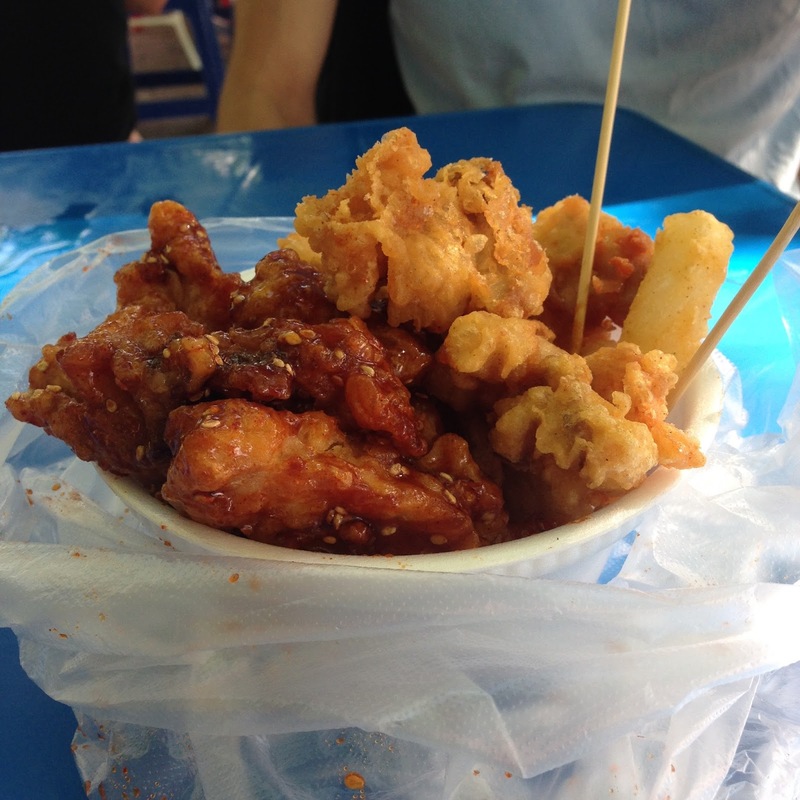 These chips are filled with air but are actually quite oily and addictive. I bought them for myself as an occasional treat on the way home. 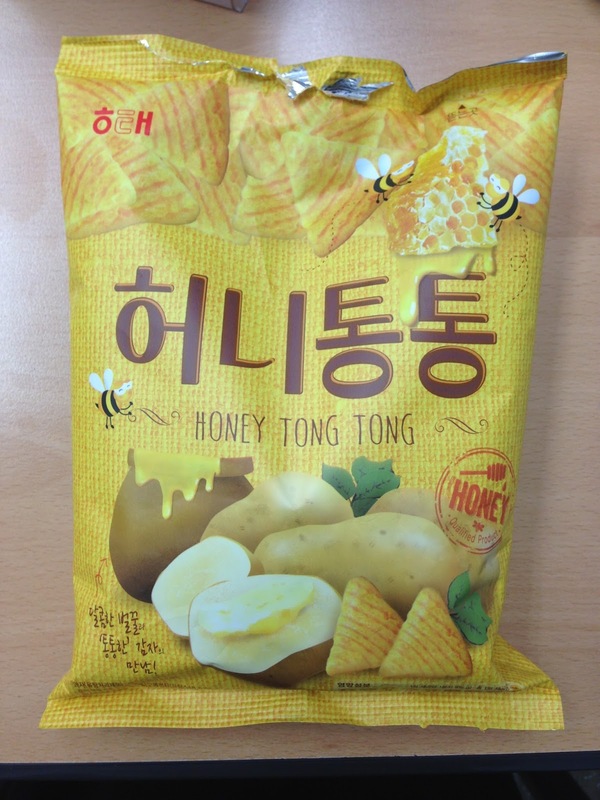 And then there’s “Honey Tong Tong,” the snack trend that swept the nation and then, like most trends, quickly died down. These chips are an interesting combination of sweet and buttery, and I have mixed feelings about them. However, I was told that during their peak, stores would sell out of them within hours. Whenever a kid brought a bag to class, all the other students would run after him for a taste and then walk off with crumby, satisfied smiles. (Then again, they did that for most food.) 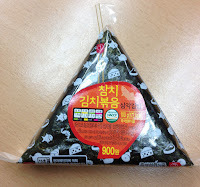 This is an addition to the more traditional Korean snacks, which I always found rather stale and not very flavorful. Koreans like to put sugar on or in everything in general, including tomato sauce, bread, and even corn dogs (along with the usual ketchup), but they also have some distinctive desserts that I’ve come to love. 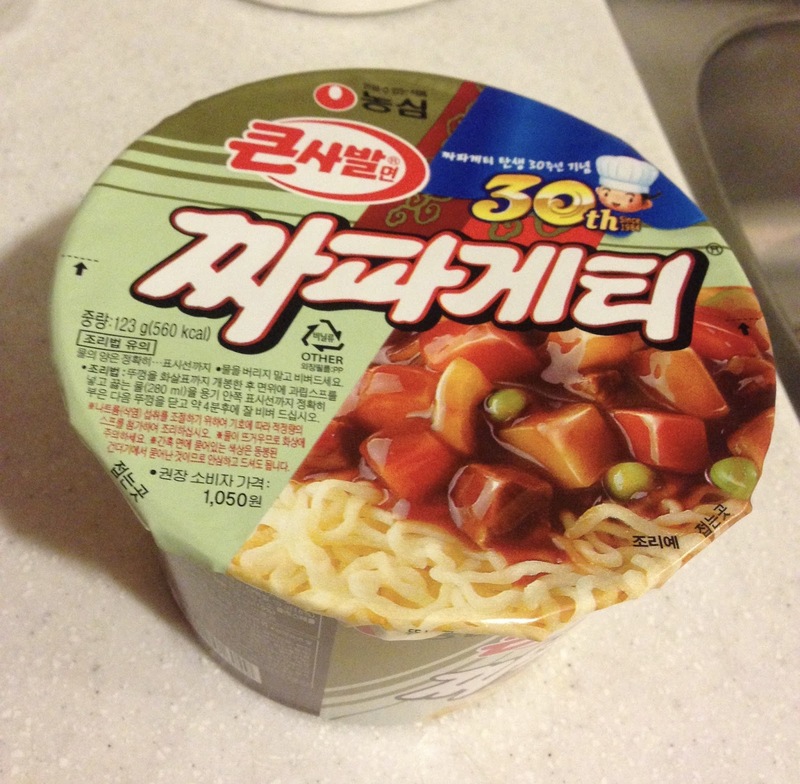 -Red bean (팥) was one of the first new things I tried in Korea. It’s found in bread, pastries, rice cakes, and even ice cream. It’s a sweet mush of brownish-reddish adzuki beans that can be an acquired taste, but I quickly learned to love it. My favorites are red bean rice cakes and red bean “fish,” pastries that are sold by street vendors in cold weather for three a dollar. 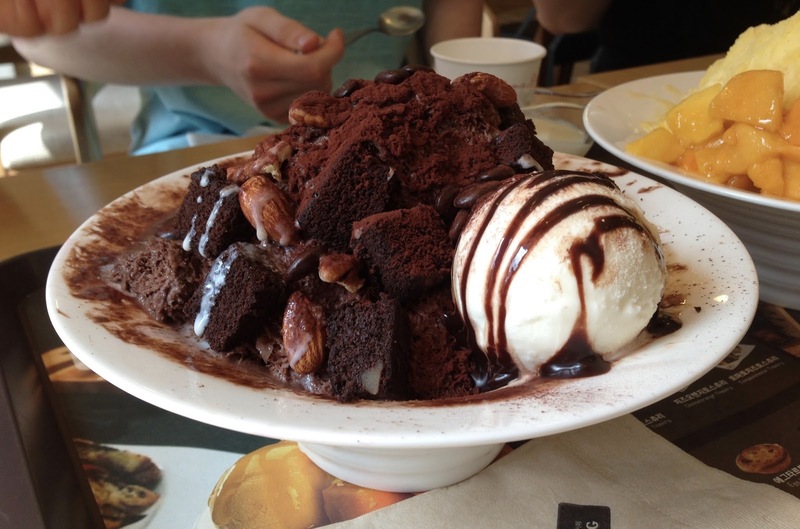 -Bingsu (빙수) is kind of like shaved ice cream, if you can imagine it. It’s not cheap and often comes in a giant, heaping bowl easily shareable between two or three people. It’s offered in different flavors and with various toppings, including fruits, brownie chunks, actual ice cream, or the more traditional red bean. The bingsu special I ordered once, shown on the bottom left, even had cheese puffs, a piece of candied orange, and actual slices of cheesecake, in addition to frozen berries and a scoop of vanilla ice cream on top. What’s nice about bingsu is that it’s generally light and fluffy and doesn’t make you feel five pounds heavier once you’ve finished it. In fact, it’s good enough that I have to show you four pictures of what you’re missing out on. 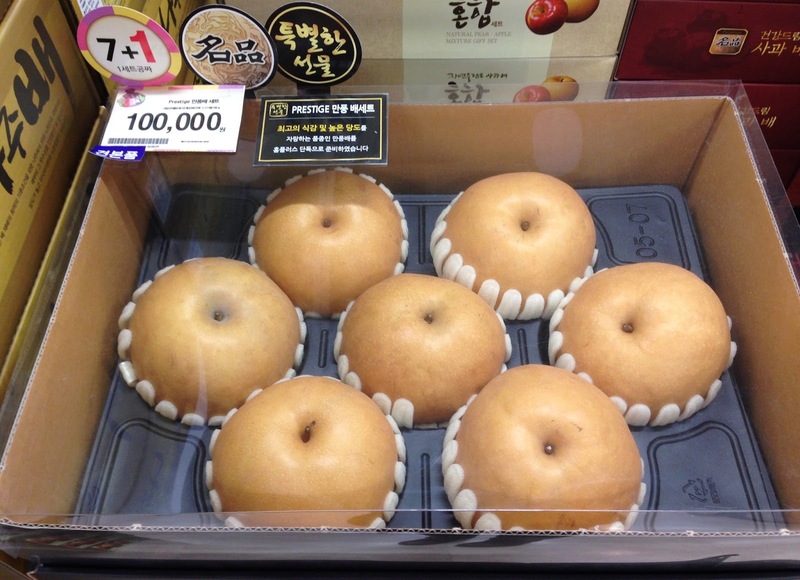 -Although Korean apartments don’t have ovens, Koreans love their bakeries. One of the most popular is called Paris Baguette, and I’ve found some very interesting pastries there. Many include red bean, but then there are things like giant sugary hotdog twists that make you question the traditional definition of a pastry. 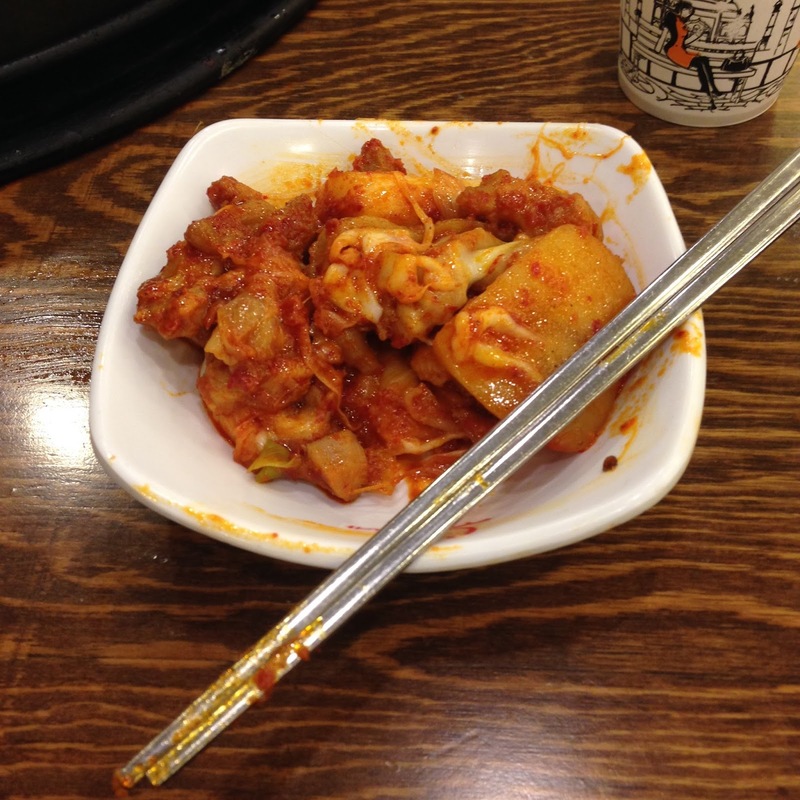 Have you ever eaten Korean food? If not (and you should), what do you want to try the most? Leave a comment below! 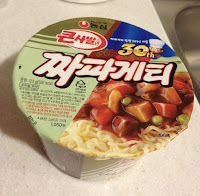 Before I went to Korea, I really had no idea what Korean food would be like. I assumed there would be a lot of rice and noodles involved, which was correct. But I quickly learned to like or at least appreciate all the variety I found, some of which I’ll share with you. 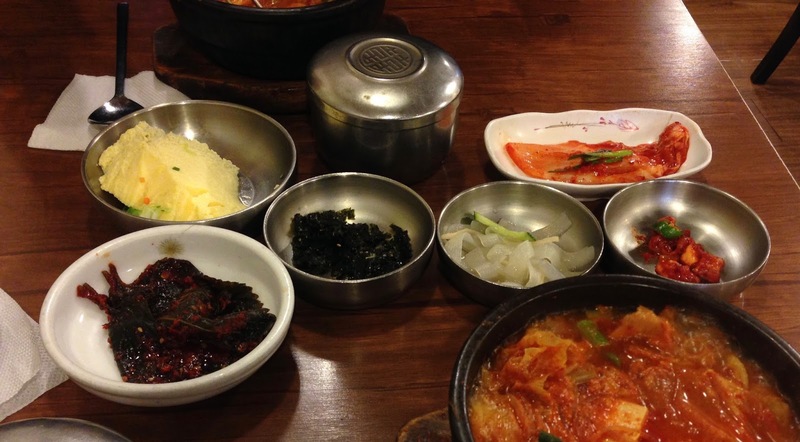 But first, some basics about Korean restaurant and food culture. 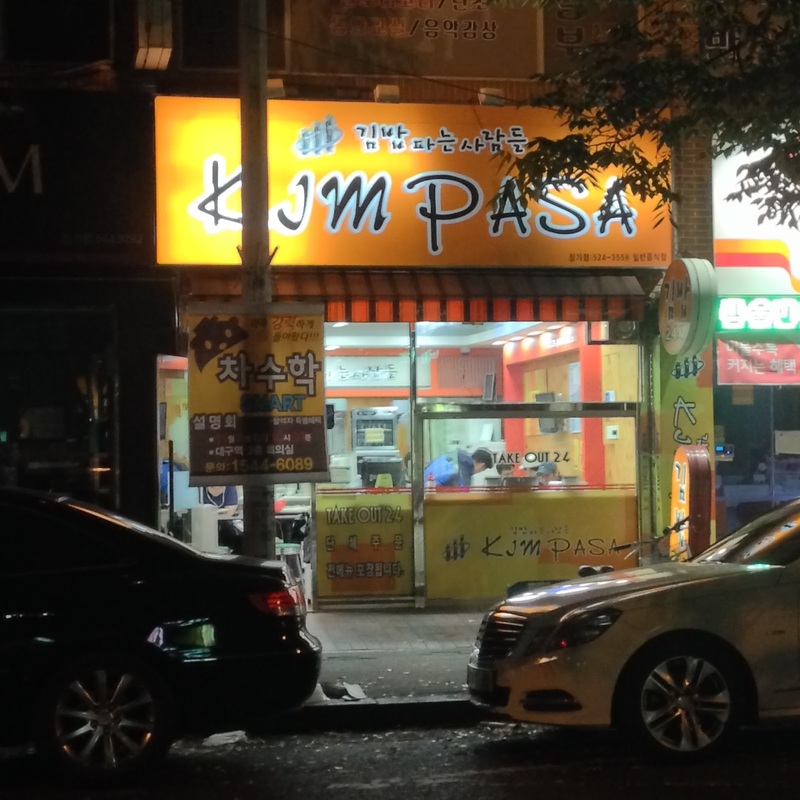 -Many Korean restaurants tend to be very specialized. That means they have limited, if any, options that aren’t variations of the main dish. The good news is that you know the dish will be good. The bad news is that you’re out of luck if you don’t feel like having what the rest of your group wants. 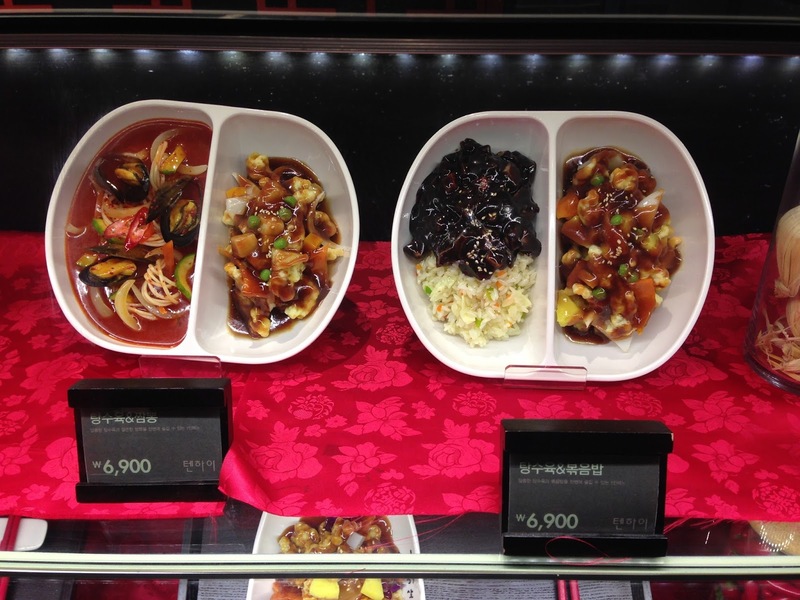 -Every restaurant meal begins with side dishes. 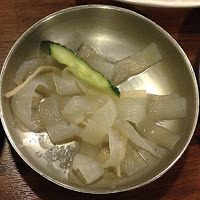 Kimchi and yellow pickled radish are standard, but you can also get soup, whipped boiled egg, sesame leaves, squid, etc. I love this because I get to try little bits of many different things. -Another nice thing about many restaurants, especially the larger ones, is the buttons on the tables. When you’re ready to order, you press the button. When you need more of something, you press the button. There are no hovering waiters constantly asking if you’re ready or if you want something else. When you need them, THEN they’ll come. -There’s no tipping, and tax is included. It’s wonderful. You don’t even have to pay tips for delivery! Going back to 15 or 20% tipping is probably one of the most annoying parts of being back in the States. 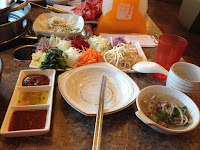 -Many Korean restaurants are all about sharing food. You get a big plate in the middle of the table and everyone dives in. Reaching in directly with your chopsticks isn’t a problem, either. Unfortunately, these restaurants also give you only one menu for four people and you have to share that, too. -A few of the more traditional Korean restaurants involve sitting on small cushions on the floor instead of on chairs. I don’t mind it but I know it can get uncomfortable for longer-legged people. 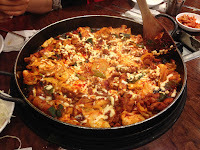 -The food in restaurants isn’t always brought out at once, especially for big groups. This means that one person in the group might already be finished while another person is just getting his or her meal. In other words, there’s no point in being polite and waiting. Just go ahead and dig in. Yep, that’s all you get. -There’s no such thing as free refills. 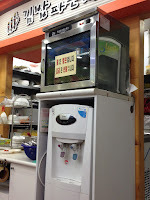 Smaller restaurants have self-serve water and offer very small metal cups that they keep in these weird metal sanitation cupboards. I’m still not sure how effective they really are. 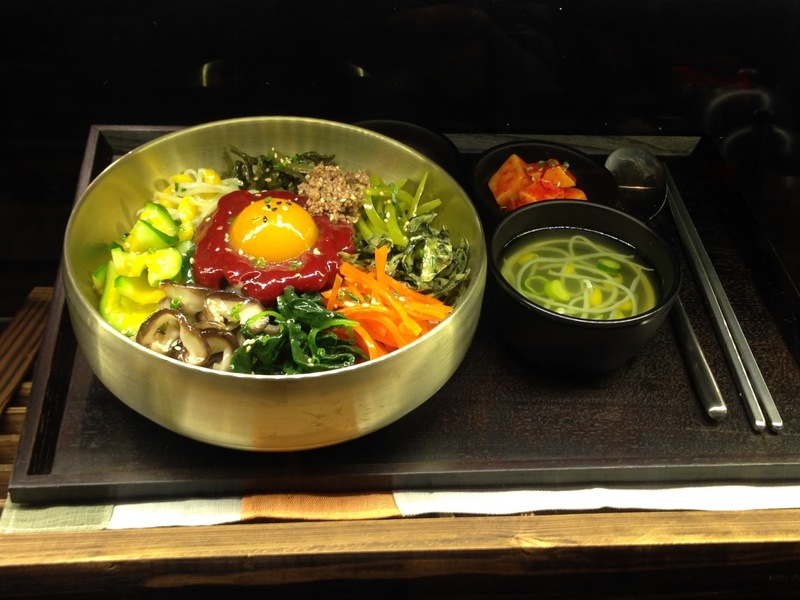 -The silverware in Korean restaurants consists of a spoon and a pair of metal (not wooden) chopsticks, but in Western restaurants you can find the usual fork and knife. Somehow the napkins are always the same wimpy, thin little tissues that are barely enough to wipe your mouth with once, which means I have to consume more than a dozen for an especially spicy or messy meal. And when there’s sharing involved, the plates for each person are so small that you have to refill them several times before you’re full. Theoretically you could say that might make you eat less, but in reality I don’t think it makes a difference. -I can’t tell you how many times I’ve ordered something spicy and have been warned by the well-meaning waitress that it might be too hot for me. I know I’m a foreigner, but are all Westerners really that bad when handling spice? -The food displays here are amazingly accurate. Many restaurants have exact replicas of their food sitting out in their windows and enticing passers-by. Although they’re made of plastic or rubber, many times I’ve had to take a closer look to determine that they’re actually not real. Tell me this does not look real. 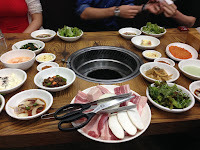 -Like a good tourist, I learned about all the proper, traditional Korean restaurant customs before I arrived in the country. For example, it’s the youngest person’s responsibility to hand out the silverware and drinks to the rest of the group, you have to pour water with two hands, etc. But whenever I hung out with Koreans, who were usually older than me, they really didn’t seem to care. Maybe I was excused because I was a foreigner. 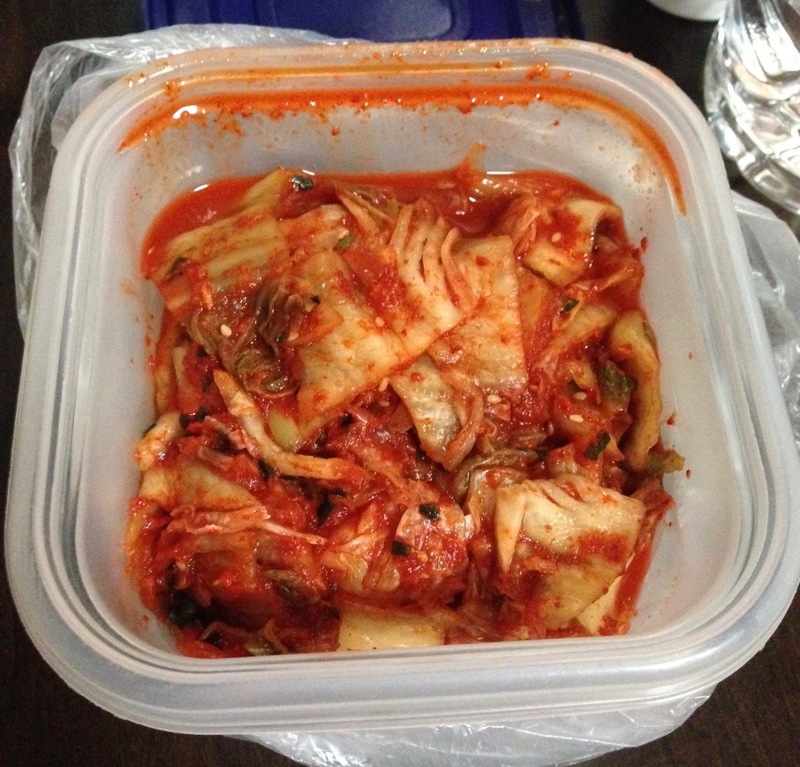 -Kimchi, or spicy fermented cabbage, is a staple of all Korean meals. It’s served as a side dish in every restaurant, and it’s an ingredient in several dishes. 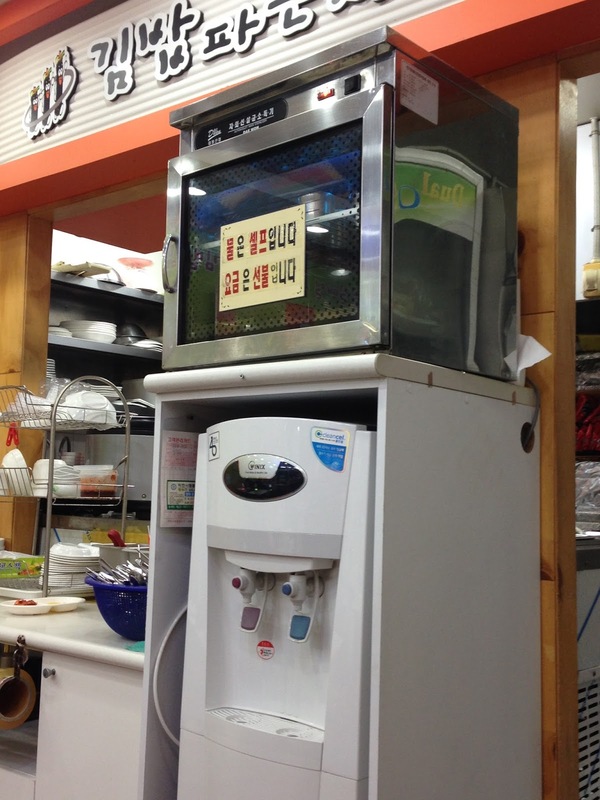 There are special “kimchi refrigerators” sold to hold families’ yearly supplies of kimchi. 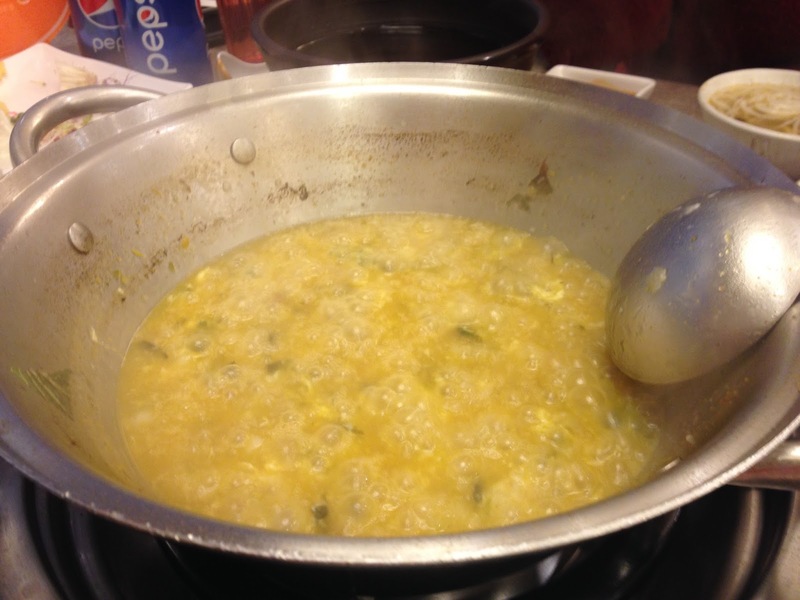 When I ask my students what they eat for breakfast, they say rice, soup, and kimchi. I went to dinner with a Korean woman once and she was upset that the Indian restaurant we went to didn’t have kimchi. When Koreans take pictures, they say “kimchi” instead of “cheese.” If you don’t like it, you’re going to be at a serious disadvantage. But for anyone who might have been told that Koreans smell like kimchi, that’s ridiculous. It’s as true as saying that all Americans smell like cheese. Just…no. -Another staple is yellow or white pickled radishes, also a very common side dish in Korean restaurants. Sometimes there are also thinly sliced green radishes. I’ve been told they’re a sort of palette cleanser after all the strong flavors of Korean food. 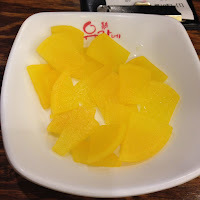 -Goguma, the Korean version of sweet potato (which is neither orange nor sweet—I tried putting it in the microwave once and it was like eating pure, tasteless starch), is also a popular ingredient in various food items. My Korean coworker even snacked on them raw as a diet food when he was trying to lose weight. 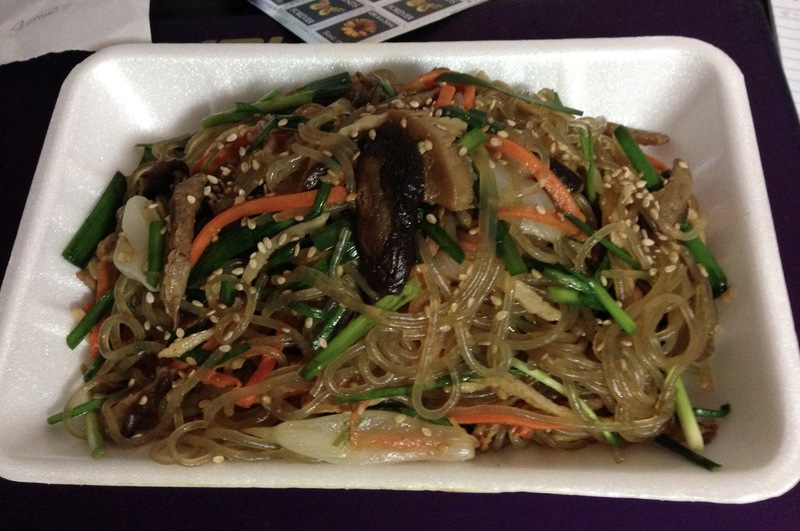 There are goguma noodles, the glass noodles used in dishes like japchae. There is goguma pizza, with chunks of melted potato plopped on each slice. 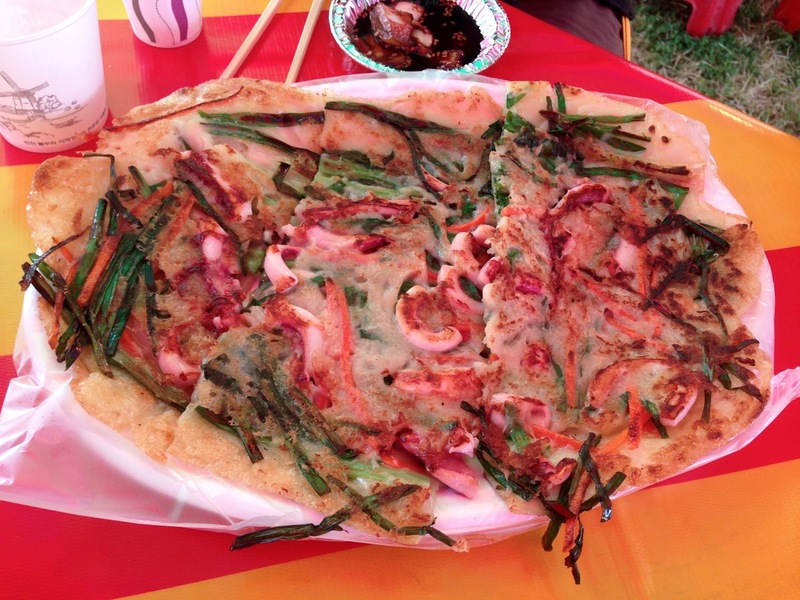 (This became my favorite type of Korean pizza and I wish we had it in the States.) 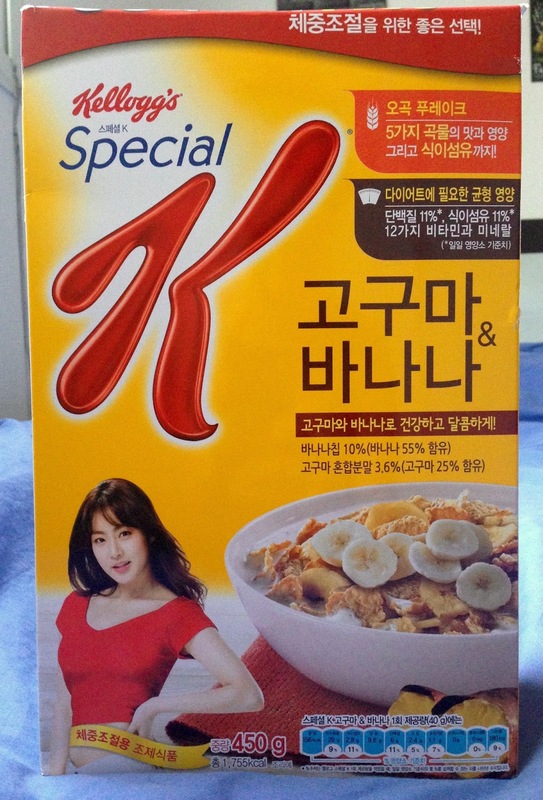 There’s even Special K goguma cereal! It literally tastes like eating flakes of sweet potato for breakfast, and it actually isn’t half bad. 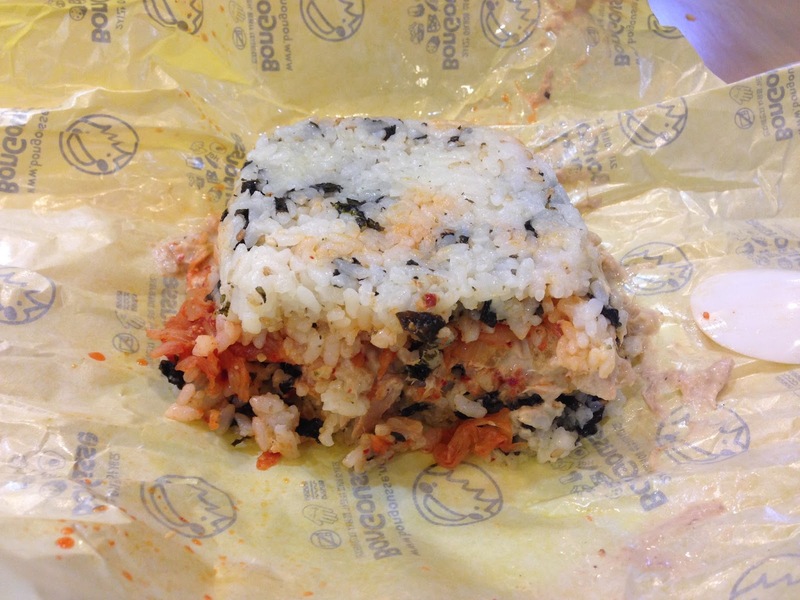 -The fast food of Korea among natives and foreigners alike is kimbap (김밥), the Korean equivalent of a sushi roll without the fish. 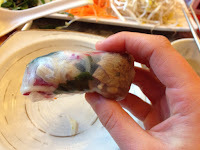 It’s seaweed wrapped around rice and any combination of meat (usually ham or spam), pickled radish, stringy gray root things, eggs, and sometimes cucumber or fish cakes. There are other combinations you can get, but a basic roll is around 1300 won (a bit more than one dollar), and grabbing one for takeout takes no time at all. 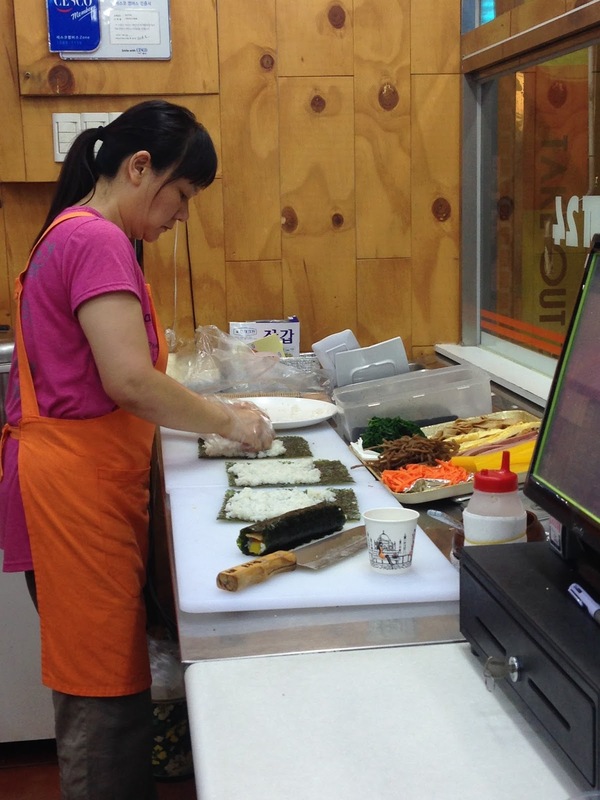 Kimbap is sold mainly in special “kimbap restaurants” found all over Korea. 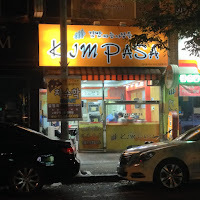 These stores are typically run by one or two middle-aged or older women, are often open 24 hours, and have a menu that covers all the Korean basics: rice, noodles, ramen, toppokki, mandu (dumplings), soup, and the like. 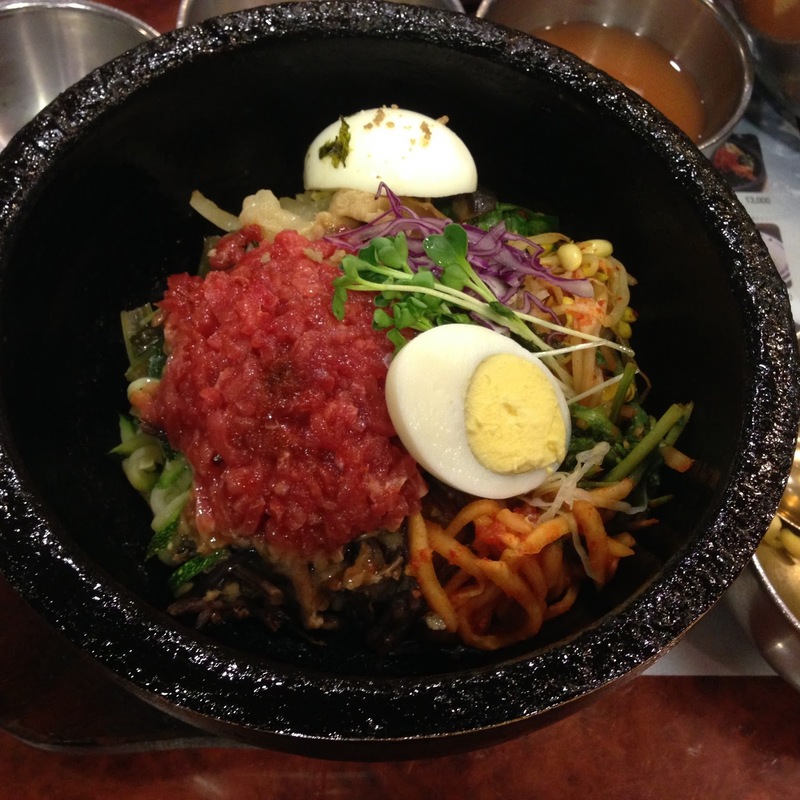 I love these places because they offer traditional Korean food for half the price of nicer restaurants. 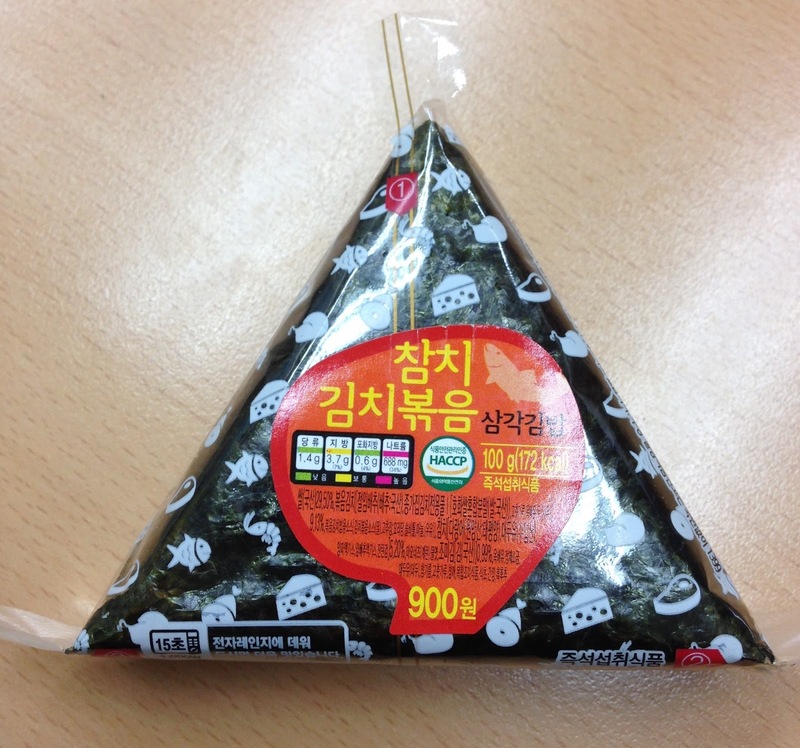 You can also buy “triangle kimbaps” at almost any convenience store, which make a great snack when you’re on the go. -I’ve never seen a society that consumes so much fried chicken, and that’s coming from a person who grew up in the States. 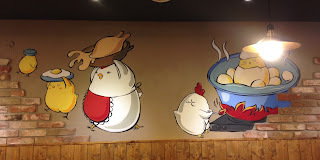 It seems like there is at least one chicken restaurant around every corner. They are often open very late, and the smallest portions they offer are easily good enough for two or three people. 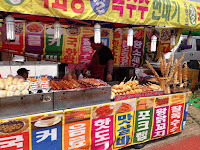 Fried chicken and beer (chimaek) is a real tradition in Korea; Daegu even has its own festival for it in July. 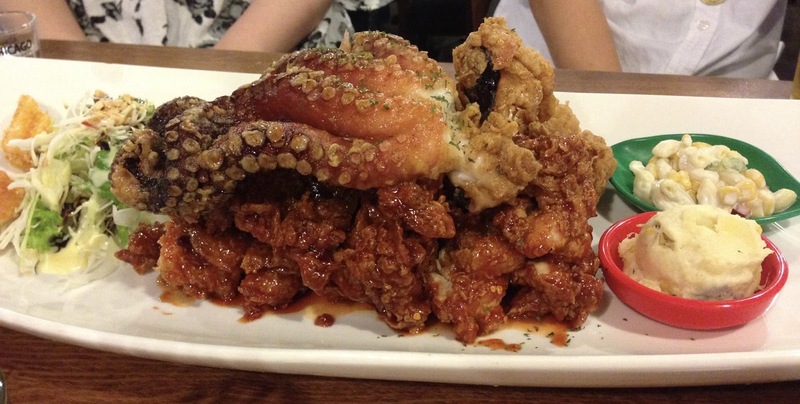 Fried chicken is distinctive in Korea because the chicken is fried twice to make it crispier and less greasy. (Double the frying means double the health, right?) I never thought I would ever eat as much fried chicken as I’ve eaten in the last year, especially when I stayed so far away from it back home. 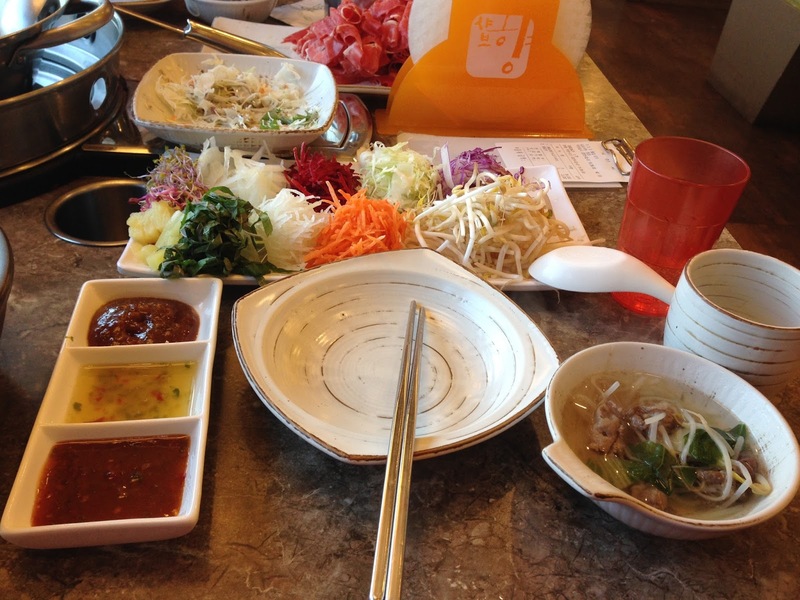 The fact that it was my very first meal in Korea should’ve been an omen. Yet I can’t deny that it was really, really good. 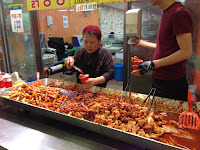 There is a little restaurant in the downtown subway station in Daegu that sells possibly the best fried and sauce-drenched spicy chicken that I’ve ever had. 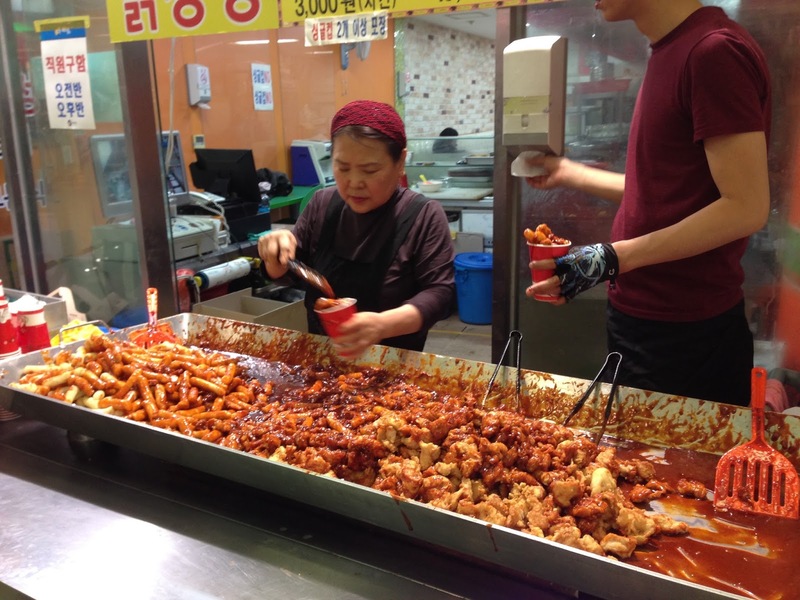 It’s a magnet for foreigners and Koreans alike, and the line for food is always long. 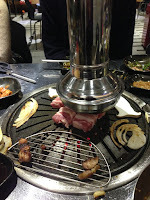 -Barbecue restaurants are also incredibly popular in Korea. Whenever the staff of my school went out for a big group dinner, it was always at a BBQ restaurant. 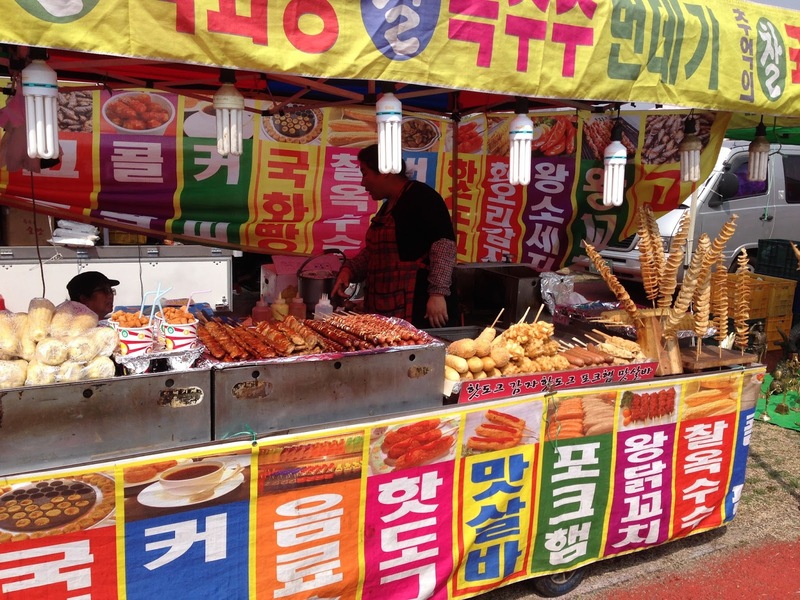 However, like fried chicken, Korea has its own spin on BBQ. Probably the most popular kind is called “samgupsal,” whose name refers to the three layers of this pig meat: meat, fat, meat. Yum… Luckily the never-ending veggie sides are enough to fill up any vegetarians in the group. 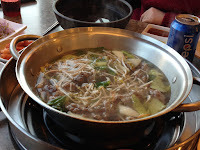 -Then there’s bulgogi, the specially seasoned beef that’s very well-known in Korea, and frankly really good even for someone who doesn’t like beef that much. 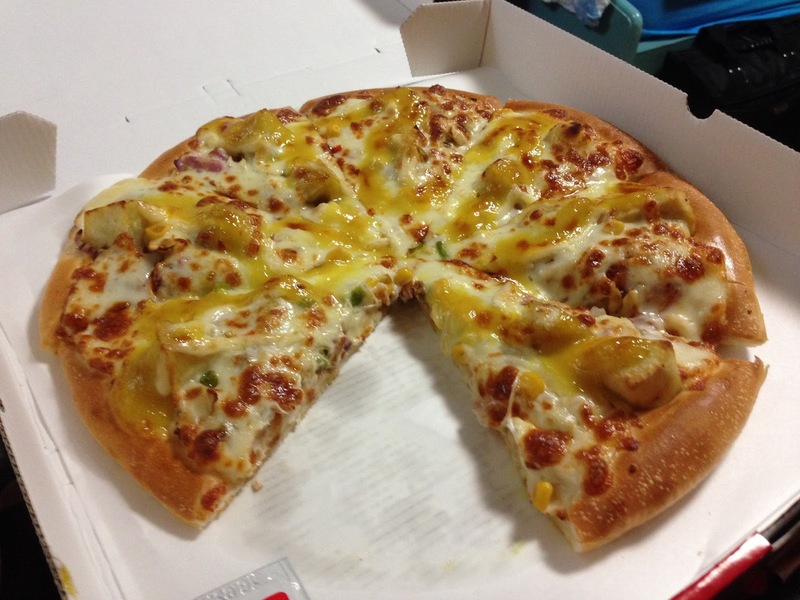 It’s in various dishes but also makes a very tasty topping on pizza. It’s in the big picture at the top of this post, too. 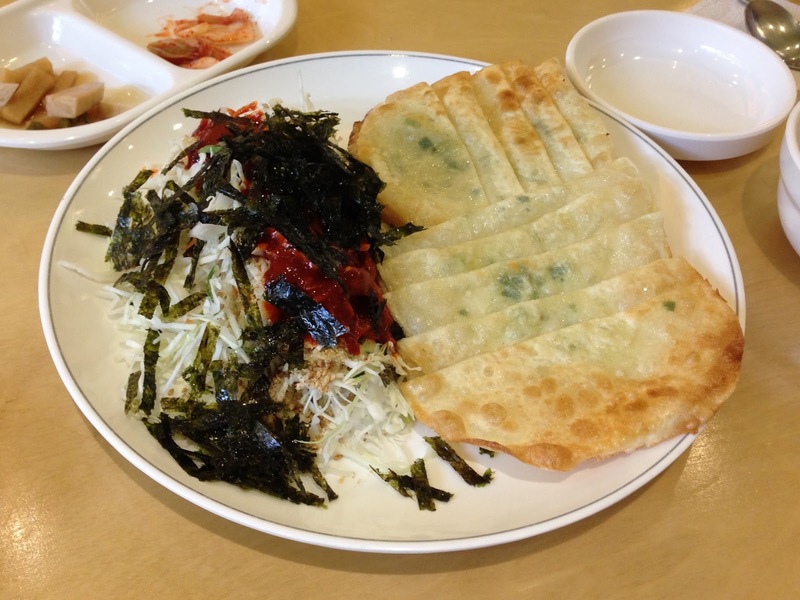 -Mandu (dumplings) are common and became my favorite home-soup filler. 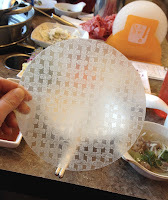 Unfortunately, almost all mandu contains pork, but I got used to it. Dumplings can be either steamed or fried, round or flat, and come in different sizes. -I should’ve expected to see ramen (“lamyeon” in Korean) everywhere in an Asian country, but the sheer amount of it still took me aback. In the supermarket, there’s a whole aisle just selling different types of the stuff. There’s a decent selection in every convenience store, and sometimes it seems like young people—even the elementary students in my school—survive on it. There’s also hot water in all convenience stores so people can buy it and eat it on the spot. It’s even incorporated into other meals; you can order several different ramen dishes in the kimbap restaurants I mentioned above. 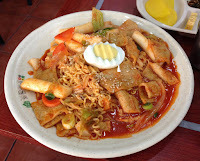 -Overall, the Korean diet is extremely carb-heavy—there is rice and/or noodles in almost every dish. 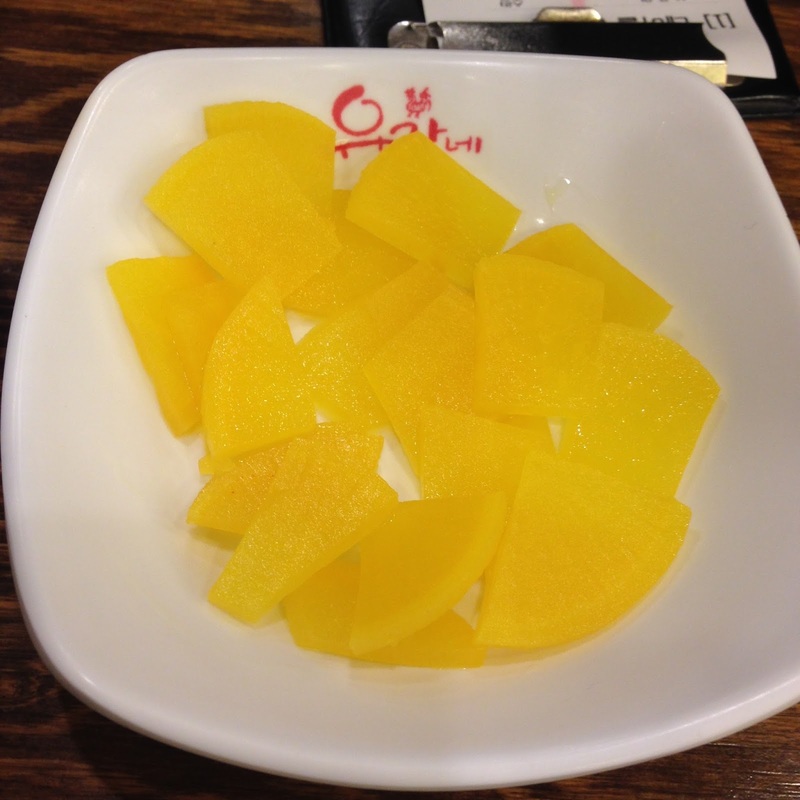 Rice cakes are also a very popular traditional dessert. 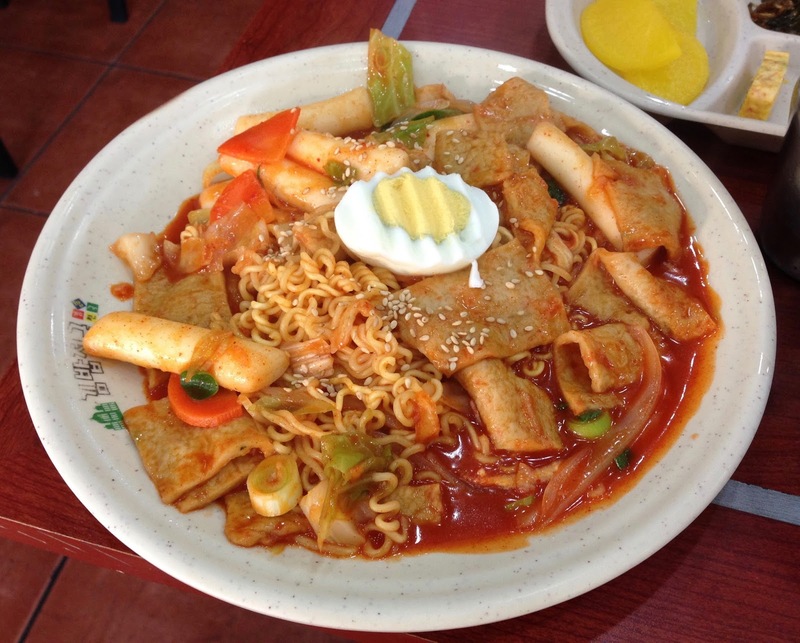 Many Koreans don’t view their food as a full meal unless there is rice involved—even if the meal already contains noodles. They love rice so much that there are even fast food restaurants that sell “bap buguh”: cheap “burgers” that have thick rice patties in place of the usual wheat buns and which you can eat with a spoon. One of the most popular kinds, pictured on the right, has a kimchi and mayo filling and is surprisingly good. 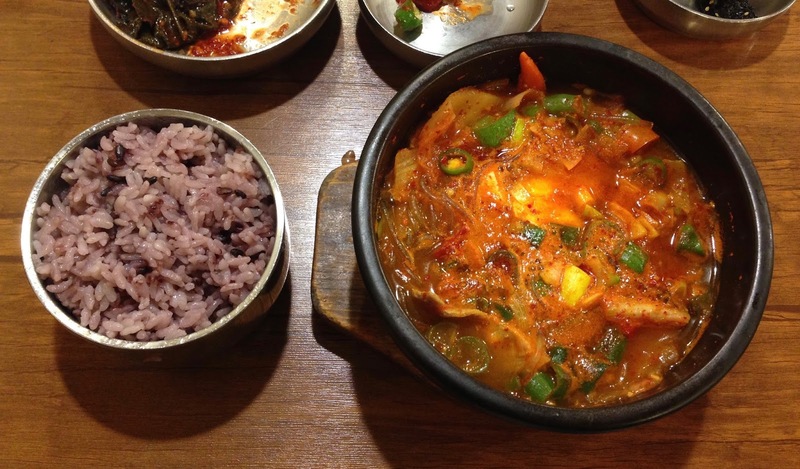 -I have to admit that I was really disappointed when I first came to Korea at how difficult it was to find food with a decent amount of veggies in restaurants. You can certainly find plenty of fresh produce in supermarkets, but I was told that most vegetable cooking happens at home. People go out to eat meat because it’s so expensive to buy themselves. It’s also very hard to find organic food or whole wheat products. Only $13 for each pear! -Fruit can be ridiculously expensive, too. Even though Daegu is known for its apples, sometimes one apple was the equivalent of $1.50. A small/medium avocado was $2.50-3.50. 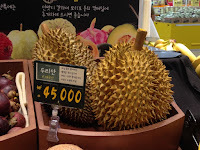 During big holidays like Chuseok (Korean Thanksgiving) and the Solar New Year, fruit baskets could cost more than $90. A single durian, a fruit that is popular and very cheap in countries like Thailand, was the equivalent of $38. WHAT. And cereal! I feel like I spent half my salary on cereal alone. In Korea, paying $5 for a 500g box was a GOOD deal. The cheapest I ever found was $3.50. The most expensive was $9 for a box that wasn’t even that big. I understand that cereal is an imported good and not a popular Korean breakfast, but really Korea?? -On the other hand, street food is cheap, delicious, and, despite having nothing healthy in it, hasn’t once given me food poisoning or stomach problems from unsanitary conditions. It’s quite varied as well. 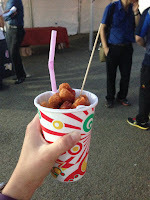 It includes red bean desserts, corn dogs (sometimes with bits of potato stuck in them), toppokki (more about that later), “fish cakes” (basically ground up fish with flour and spices), potatoes twisted on a stick, marinated chicken on a stick, giant hotdogs on a stick, various delicious fried things…. 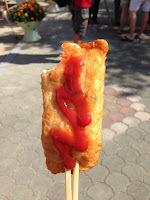 Basically the only healthy street food I’ve gotten was a giant cob of corn on a stick. 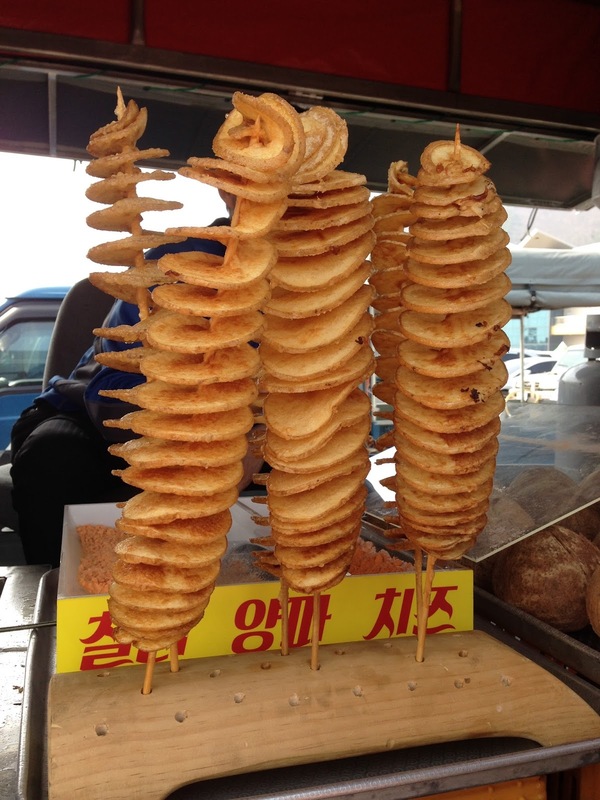 Oh, and Koreans eat churros, too. 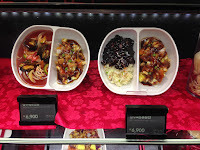 Anyway, the next post will be more about individual foods and dishes—the basic, the complex, the weird, and the sweet! It’ll be up very soon—go check it out.